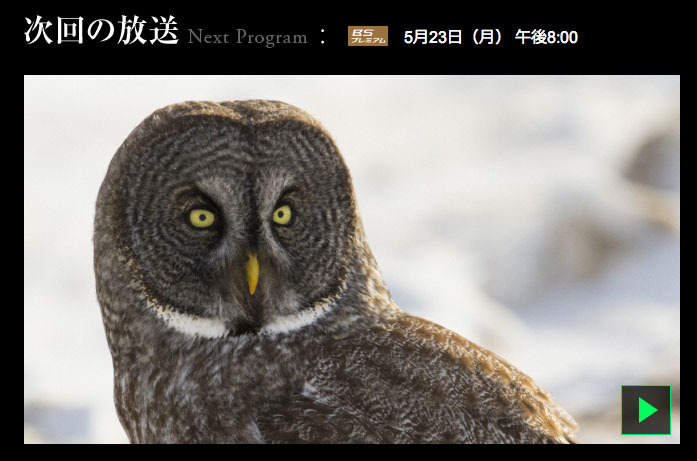 NHK "Wildlife" on air schedule　"Land of Northern Extreme, Canada----Large Owls hunt Invisible Prey"
The south of Manitoba, Canada is the Kingdom of Owls. It is home to 11 species of owls such as snowy owls in pure white coat. Among them, great grey owl is the biggest of all. During long severe winter, they use their large face as radar to spot mice hidden under the snow. On the extreme conditions, the temperature drop down to minus 40℃ on the northern snow field. The programme reveals amazing technique of hunting skills of great grey owls. It also features intimate breeding behaviour seen only deep in the woods during spring.